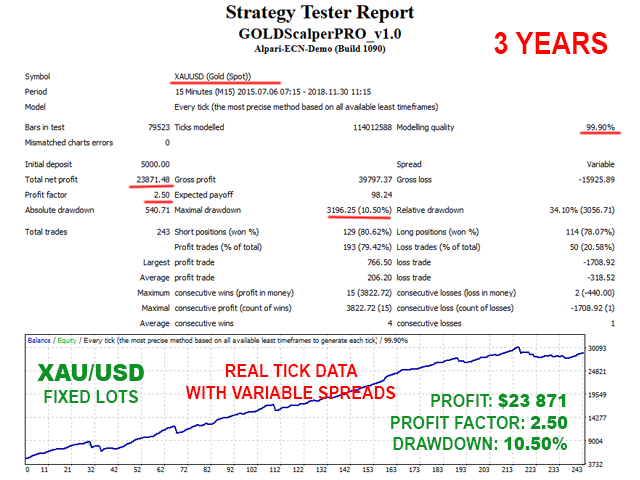 You should not be fooled by the low price – GOLD Scalper Pro is a very effective and profitable trading strategy, professionally developed especially for trading GOLD (XAUUSD). I have used the most proven trading principle since the markets exist – namely a position entry in the direction of a distinctive market impulse and a following correction. This principle has been proven rock solid since the markets exist and it has been widely exploited by the “Smart Money” traders. I know this, because I am using this trading pattern more than 15 years in a different way in many trading systems and it just does not fail. 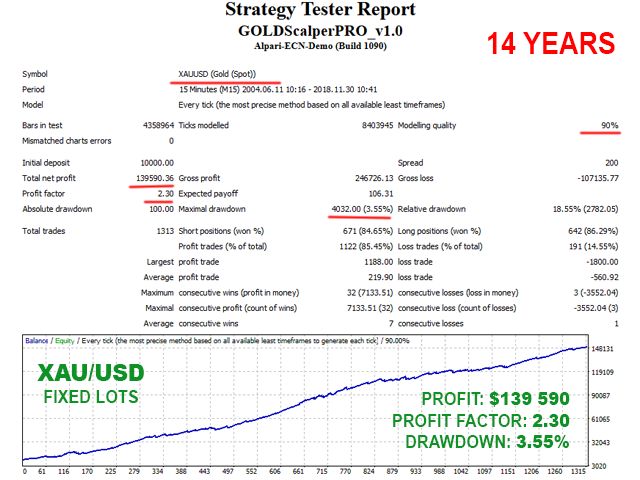 GOLD Scalper Pro is not just another curve fitted system with a hundred parameters. On the contrary - the trading logic is so strong and reliable, so it needs a few parameters to be profitable. 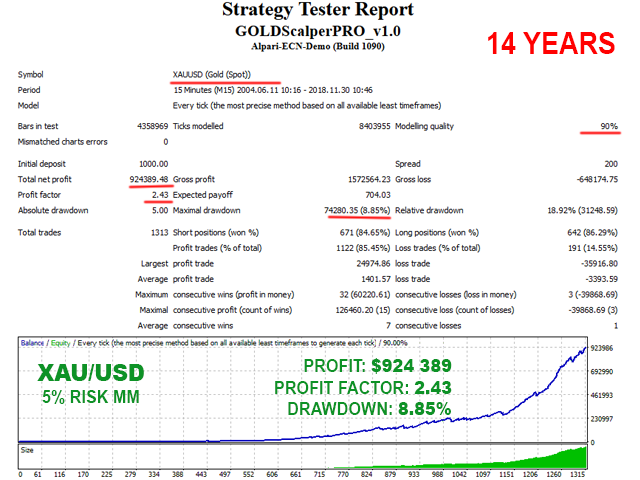 GOLD Scalper Pro is not a grid, martingale, or other risky strategy – it is a classical trading strategy by a textbook, which uses reasonable Stop Loss levels and an effective entry and exit trading logic. There is a MT5 version too! Click here to check it! 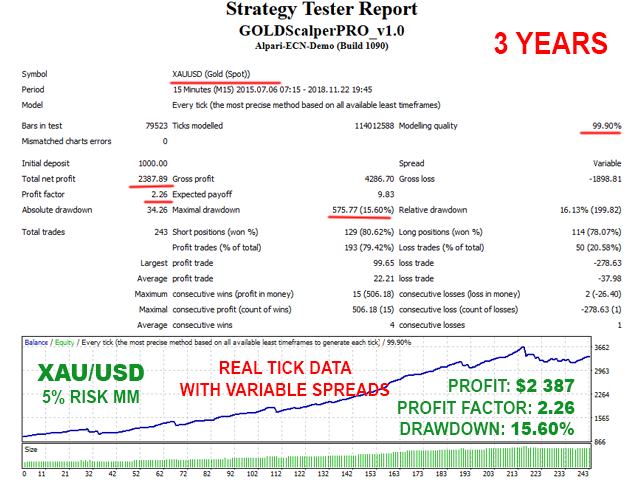 In addition, I have performed 99.9% quality Real Tick and Real Spread backtests, which prove that GOLD Scalper Pro is profitable under real market conditions. 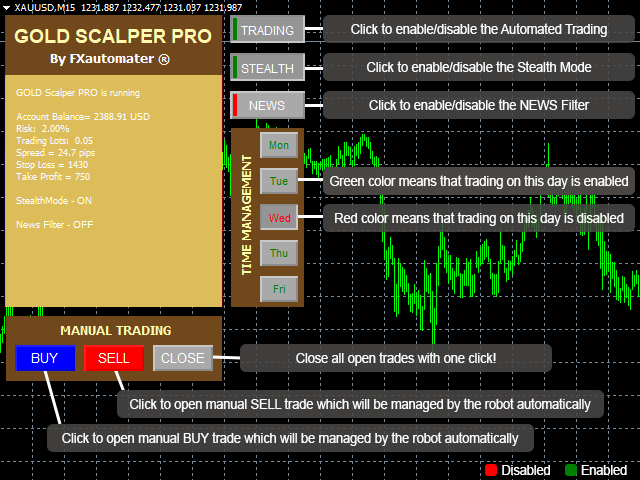 Please, test the GOLD Scalper Pro on a demo account first in order to get familiar with all features and settings! Especially the lot size could differ between the brokers (normally it is 100 ounces per lot), so it is very important to make sure that the AutoMM function calculates the right lot size, which should be approximately 0.1 lot (10 ounces) at $10k account size and AutoMM=1. Respectively 0.01 lots with AutoMM=1 for account size $1000. For reference only, AutoMM=5 should open 0.05 lots on $1000 account balance. Make sure that the spread of your broker in normal conditions does not exceed 400 pips (40 cents) in XAUUSD (GOLD/USD)! You can use Auto MM=2% (low risk) up to 10% (high risk), according to the significance of your account and your risk and profit expectations.Reasonable fixed Lot size is 0.05 on 1k account balance, or 0.5 lots on 10k account balance. You can run the EA on M1 or M15 chart – it makes no difference for the EA, as all used time-frames are hard-coded. You can backtest and optimize the EA on M1 chart by “open price only” method – this will be correct enough and you will save a lot of time. Finally, please, bear in mind that Holy Grail in trading does not exist! Even the best system suffers some bad periods. GOLD Scalper PRO is using very reasonable SL levels, so they can get hit /even repeatedly/ in bad market condition. Please, do not leave negative comments after every SL hit, or losing trade! For more info and COMPLETE LIST OF SETTINGS, visit the blog! Click here! If you want to be notified of my new products, please add me as a friend! I regularly publish new forex robots!